The Uganda Cranes were held to a 1-1 draw by Egyptian top tier side El Gaish on Wednesday. Out of favour Vipers midfielder, Moses Waiswa scored the Cranes only goal of the game in the first half before El Gaish equalized later on. Cranes head coach Sebastian Desabre made several changes to the team that usually starts, handing game time to goal keeper Rober Odongokara, Tadeo Lwanga, Allan Kyambadde and KCCA FC Captain Timothy Awanyi. However, it was Waiswa, a player who has had spells on the bench for his club Vipers this season, who came up with the goods on 15 minutes, putting the Cranes ahead. Despite controlling the majority of the first half, Desabre’s side could not add onto their lead and went to the break with a slender 1-0 advantage. In and at the start of the second half, wholesale changes were made to the team but they could not hold onto their lead as they conceded a 79th minutes equalizer to draw 1-1 in the end. This was the Cranes second build up game in four days having defeated Kampala Select 4-0 at Lugogo on Saturday. The team will continue training on Thursday ahead of their last Group L AFCON qualifier away to Tanzania on Sunday. 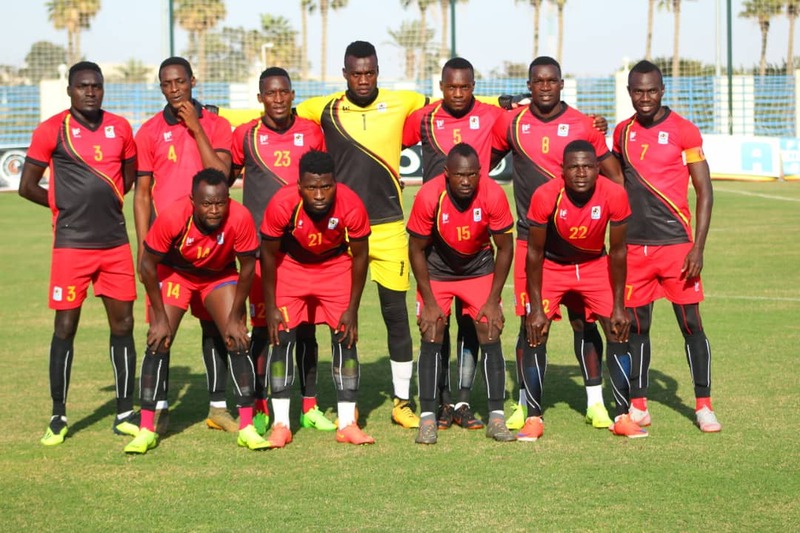 Uganda has already qualified for the 2019 AFCON in Egypt having gathered 13 points from their first 5 games. For Tanzania, they will have to defeat Uganda and pray that Lesotho don’t pick maximum points against Cape Verde in the other game. The Uganda Cranes Starting XI against El Gaish on Wednesday. Robert Ondongkara (GK), Nicholas Wadada, Godfrey Walusimbi, Murushid Juuko, Khalid Aucho, Tadeo Lwanga, Emmanuel Okwi (c), Moses Waiswa, Allan Kyambadde, Patrick Kaddu, Timothy Awany. Jamal Magola (GK), Sadam Juma, Allan Okello, Muhammad Shaban, Joseph Ochaya, Edrisa Lubega, Kirizestom Ntambi, Milton Karisa, Halid Lwaliwa, Hassan Wasswa. Goalkeepers: Denis Onyango (Mamelodi Sundowns, South Africa), Salim Magoola (Al Hilal, South), Robert Odongkara (Adama City, Ethiopia). Defenders: Murushid Jjuuko (Simba, Tanzania), Timothy Awany (KCCA, Uganda), Halid Lwaliwa (Vipers, Uganda), Geofrey Walusimbi (Free Agent), Joseph Ochaya (TP Mazembe, DR Congo), Kirizestom Ntambi (Ethiopian Coffee), Nico Wakiro Wadada (Azam, Tanzania). Midfielders: Khalid Aucho (Churchhill brothers, India), Hassan Wasswa Mawanda (Free Agent), Tadeo Lwanga (Vipers, Uganda), Ibrahim Sadam Juma (KCCA, Uganda), Moses Waiswa (Vipers, Uganda), Moses Opondo (Vendsyssel FF, Denmark).